In light of a sudden spurt of cow vigilantism in India, we take a look at states where cow slaughter is either allowed or banned. The issue of cow vigilantes targeting civilians belonging to minority groups has found mention in the Parliament during a discussion on the ‘atrocities against Dalits’, with JD(U) leader Sharad Yadav questioning the government why gau rakshaks aren’t banned. “Who created this Gau Rakshaks, why doesn’t the government ban it? What is this tamasha?” said Sharad Yadav. Earlier this month, the flogging of seven members belonging to a Dalit family by gau rakshaks in Gujarat led to widespread protests in the state, with many activists attempting to commit suicide. The Dalit family was attacked by cow vigilantes for allegedly slaughtering a cow. An investigation by the Gujarat CID revealed that the cow was, in fact, killed by a lion. The Dalits were merely skinning the dead cow to sell its hide. Within days, two Muslim women were thrashed by members of a right-wing group on the suspicion of carrying beef at a railway station in Madhya Pradesh. Home Minister Bhupendra Singh, however, clarified that meat seized from the two Muslim women is that of a buffalo and not a cow. In light of this sudden spurt of cow vigilantism in India, we take a look at states where cow slaughter is either allowed or banned. In northern India, cow slaughter is illegal in all the states, with Jammu & Kashmir and Jharkhand leading the list in the terms of severity of punishment. A person found guilty of cow slaughter can be sent to 10 years imprisonment in these two states. In Uttar Pradesh, where a Muslim man was lynched in Dadri for allegedly consuming beef, slaughter of cow, bullock, ox is banned. The law prohibits one to store or eat beef. It carries a punishment of 7 years’ jail and/or Rs 10,000 fine. There is a caveat, however. One can import beef in sealed containers, to be served to foreigners. And Buffaloes can be killed. Haryana was also in the news this year where two men were force fed cow dung and urine by cow vigilantes. In a video shot by the perpetrators, the vigilantes were seen forcing down the victims’ throats a cocktail of cow dung, urine, milk, curd and ghee. The victims were allegedly transporting beef. The law in Haryana states that a a person can be sent to 3-10 years jail and fined up to Rs 1 lakh for cow slaughter. The law also prohibits killing of disabled/diseased/barren cows. The ban also extends to the sale of canned beef and beef products, and export of cows for slaughter. In Delhi, the Kerala House row saw police raiding a canteen on its premises for allegedly serving beef. The police acted on the complaint filed by a Hindu Sena leader who alleged that beef was available on the canteen’s menu. The canteen refuted the allegations saying that the meat being served was not beef but that of a buffalo. However, buffaloes do not come under the ambit of the state law. The law only prohibits slaughter of “agricultural cattle” — cow, calf, bull, bullock — and “possession of [their] flesh”, even if they are killed outside Delhi. Madhya Pradesh amended their law against cow slaughter in 2012, raising the maximum punishment to seven years jail. The law bans the practice of killing cow and progeny. If arrested, the burden of proof lies on accused. However, buffaloes can be killed, which means the two Muslim women thrashed at a railway station by members of a right-wing group are not guilty. Bihar: Slaughter of cows, calves banned; of bulls, bullocks older than 15 years allowed. Violators face 6 months’ jail and/or Rs 1,000 fine. 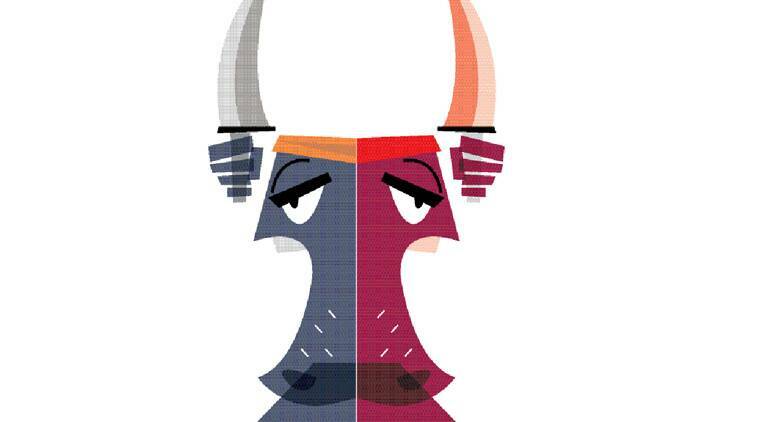 Chandigarh: Killing a cow, storing/serving/eating beef banned; eating meat of buffalo, bullock, ox also banned. Chhattisgarh: Slaughter of cow, buffalo, bull, bullock, calf, and possession of their meat banned. Transport, export to other states for slaughter also banned; attracts same punishment of 7 years’ jail, fine up to Rs 50,000. Himachal Pradesh: Slaughter of all bovines punishable by 5 years’ jail. Killing allowed in the interest of research, or if animal has contagious disease. Jammu & Kashmir: Slaughter of cow and its progeny punishable by up to 10 years’ jail. Possession of “flesh of any [of these] slaughtered animal(s)” punishable by a year; killing of “he or she buffalo” punishable with fine five times the animal’s price. Jharkhand: Slaughter of cows and oxen; possession, consumption of their meat, banned. Violators face up to 10 years’ jail and/or Rs 10,000 fine. Assam: Cow slaughter banned except on issue of ‘fit-for-slaughter’ certificate, at designated places. Other Northeast states: No ban in Arunachal, Mizoram, Meghalaya, Nagaland, Tripura, Sikkim. In Manipur, Maharaja in 1939 decreed prosecution for cow slaughter, but beef is consumed widely. Gujarat: Members of a Dalit family were recently flogged by cow vigilantes for skinning a cow. The gau rakshaks allegation that the Dalit family slaughtered the cow was disproved by the Gujarat CID, when a probe found that the cow was killed by a lion. However, the state of Gujarat bans the slaughter of cow, calf, bull and bullock; transport, sale of their meat banned. It carries a punishment of Rs 50,000 fine and up to 7 years’ jail. The Ban does not cover buffaloes. Rajasthan: Slaughter of “cow, calf, heifer, bull or bullock” prohibited; possession, transport of their flesh prohibited. 10 years’ imprisonment and/or Rs 10,000 fine. Maharashtra:Slaughter, consumption of meat of cow, bull, bullock banned since March 2015 after revision of existing law. 5 years’ jail and/or Rs 10,000 fine. Slaughter of buffaloes allowed. Kerala is the only state in the south where there are no restrictions on the slaughter and consumption of cow meat. Tamil Nadu: Cow, calf slaughter banned; up to 3 years’ jail and/or Rs 1,000 fine. Beef consumption and slaughter of economically worthless animals allowed. Karnataka: Cows can be slaughtered if old or diseased. Possession not a crime. Bill proposed by BJP in 2010 made slaughter punishable by 7 years’ jail and Rs 1 lakh fine, but it did not become law. Andhra Pradesh & Telangana: Slaughter of cows, calves prohibited. Bulls, bullocks can be killed against “fit-for-slaughter” certificate, issued if animals can no longer be used for breeding; draught/agricultural operations. Violators face 6 months jail and/or Rs 1,000 fine.